I visited the pavilion before pavilion hours to avoid the crowds – because there will always be crowds at this pavilion! 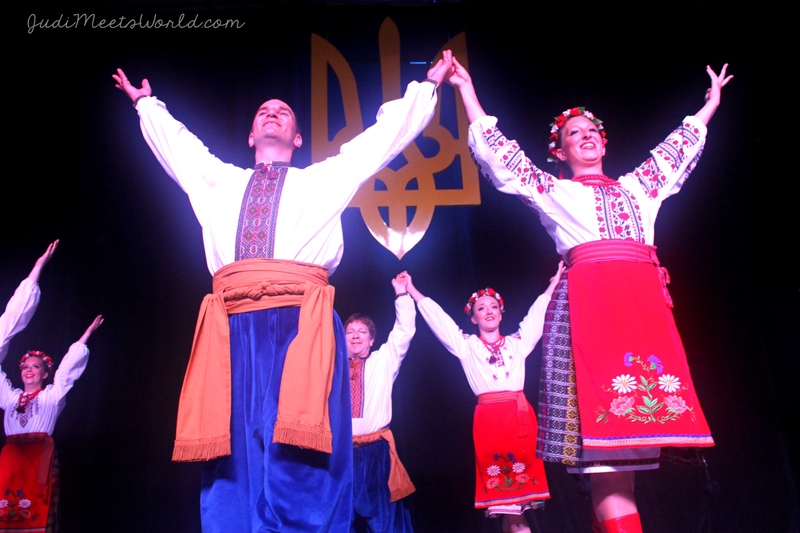 The Ukraine-Kyiv is one of the original pavilions from the start of Folklorama and it’s clear why – the support this pavilion gets is heartwarming! 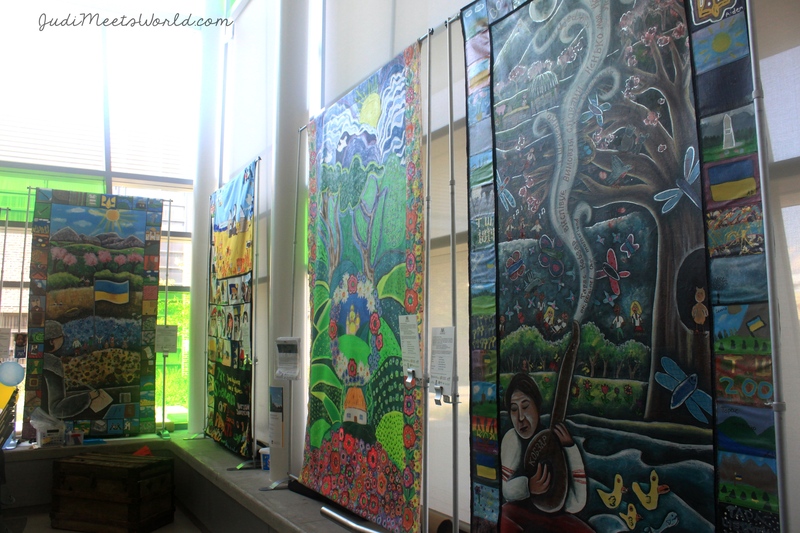 Their cultural display is curated with things brought in by volunteers and things of historical importance for the community. There was even a section dedicated to Terry Sawchuk who was a Ukranian hockey player born and raised in the north end of Winnipeg who played for the Detroit Red Wings! The marketplace area had live performances (and a dance floor to join in on the party, between shows. There were children’s activities and also a artwork from the different Ukrainian heritage schools in different divisions. The things you learn! 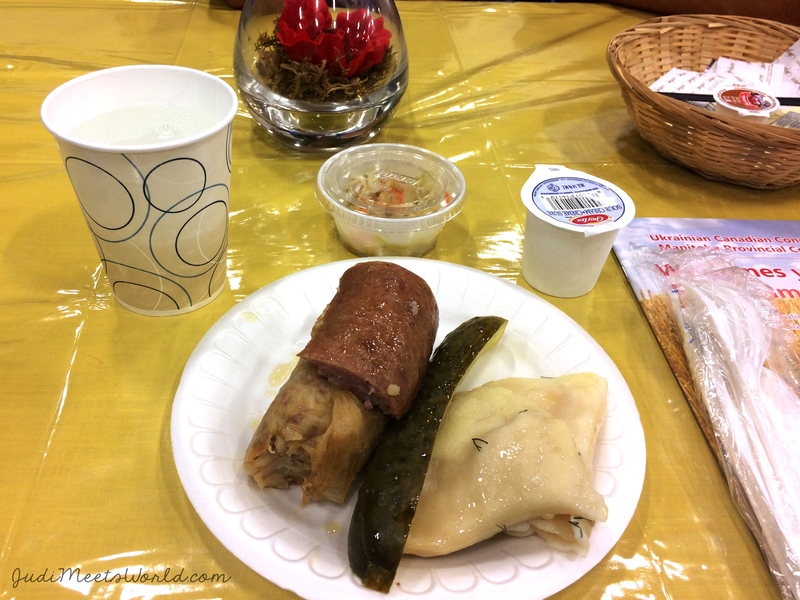 I was treated to the lovely sampler platter that had the varenyky, holubtsi, and kovbasa, all paired, of course, with a pickle. We were entertained by different dance groups ranging in age from a junior, intermediate, to adult group. there were also two very talented sisters who are also recording artists. Their record was available for purchase at the marketplace shops. The show ended with the classic Hopak – a real testament to the dancers’ endurance and energy as they twirl and jump and lift and spin their way through a 10 min (or longer) number! The hospitality at this pavilion is consistently top-ranked. They are a well-oiled machined in terms of volunteers who even have headsets to communicate effectively! Thank you again to the Ukraine-Kyiv Pavilion for such an amazing time and tour!